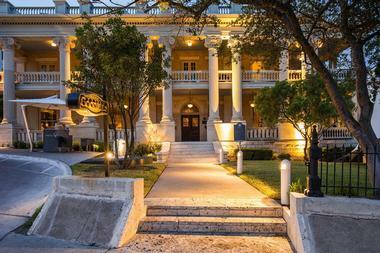 If you've decided to plan a romantic weekend getaway to Austin, the city offers many beautiful places to stay. 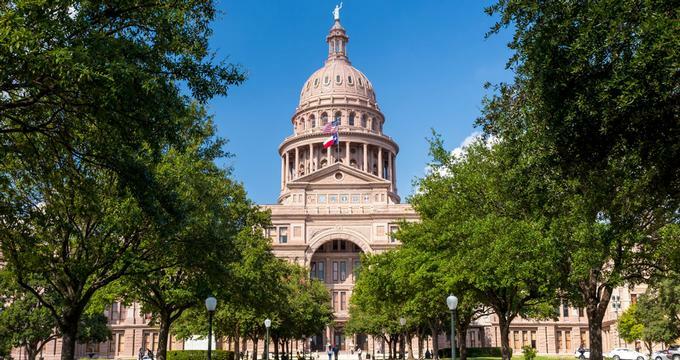 Ranging from cozy, affordable inns to luxury hotels and resorts, there is something for every taste and budget in Austin, Texas. 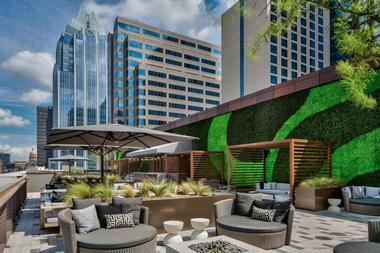 JW Marriott Austin is an upscale offering from popular international hotelier Marriott, conveniently located near top Austin area attractions such as the University of Texas at Austin and the Texas State Capitol. The elegant hotel features modern decor throughout its guest rooms and suites, which offer skyline views and top amenities such as coffeemakers, comfortable desks, and flat screen televisions. Upgraded suites offer private living rooms and access to the hotel's lounge, which provides free breakfast and happy hour appetizers. Dining options include the upscale Italian restaurant Osteria Pronto, the casual American joint Burger Bar, and a location of national coffee chain Starbucks. The Kimber Modern is conveniently located in downtown Austin and has clean lines, offering guests a designer boutique hotel with personality. You can rent one of the five rooms and two suites, or the entire hotel. Rooms all have keyless entry, a 32-inch flat-screen TVs with cable, desks, reading chairs, iPod docking stations, Sferra linens, Egyptian cotton towels, luxury Malin and Goetz toiletries, razors, toothbrushes, irons, blow-dryers, floor-to-ceiling windows, and ceiling fans. Some rooms have Happy D freestanding bathtubs while others have sliding glass doors that lead to balconies. 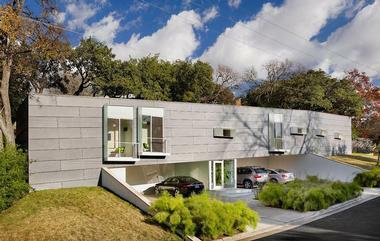 The building has a 20-foot glass water feature, century-old live oaks, and a modern outdoor fireplace. The common area has designer furniture. Guests receive complimentary wireless Internet and breakfast, and there is also a self-serve coffee system and a beverage bar, both of which are available 24/7. 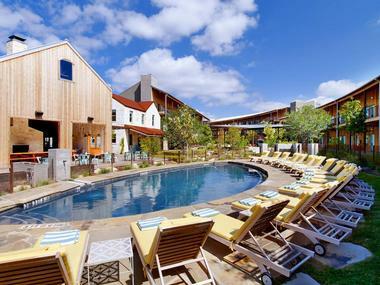 For a unique take on boutique lodging, stay at Lone Star Court, a boutique hotel with influences from old motor courts, complete with an outdoor courtyard and attractive rooms. There are 3 suites, 40 double rooms, and 80 king rooms, making a total of 123, each of which is retro-inspired. Each room has a custom Valencia bed made with Egyptian cotton linens, LATHER bath amenities, 42-inch LED TVs, and complimentary wireless access. The wireless Internet extends throughout all public areas and guests can also enjoy complimentary parking, a swimming pool, the fitness center, furnished outdoor porches, and more. You can rent a bike or listen to live music on Wednesday to Saturday nights. Enjoy a meal and cocktail at The Water Trough or a bite from the Feed Store, the Lone Star Court’s food truck. 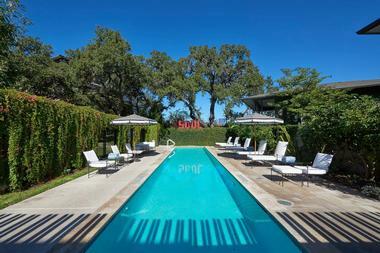 Hotel Saint Cecilia almost takes you back in time thanks to its inspiration from the late 1960s and early 1970s. There are five suites, three studios, and six poolside bungalows to stay in, each of which is inspired by a famous musician or group. Each room has a spa minibar with body care products from Santa Maria Novella. The hotel also boasts a beverage and food minibar with European and local products, and it is pet friendly. The grounds are secluded and lush, offering a private area to gather your thoughts or simply relax. Guests have access to a lending library full of vintage LPs, poetry anthologies, and rock biographies. The concierge is available all day long and can also help you borrow a guitar. The hotel has a 50-foot heated lap pool available to guests 24/7, and you can also sit by the pool underneath the trees to enjoy a light meal or breakfast. Austin’s Inn At Pearl Street has been in the area for more than 20 years, allowing guests to relax in an authentic vintage atmosphere. The inn combines the tranquility and privacy of small town bed and breakfasts with southern hospitality of self-service boutique hotels. There is wireless Internet throughout the entire property. Some rooms also have private dining and kitchen areas, queen or king beds, private balconies with views of the historic downtown, fireplaces, or in-suite Jacuzzis. The Victoria House has five rooms, while the Burton House has three. There is also a cottage available with four rooms. Standard room amenities include flat-screen TVs with DVD players and VCRs, and private bathrooms. In the morning, you can enjoy a full continental breakfast and hot coffee or hot breakfast right in your room. There is a range of packages available, including those ideal for romance. 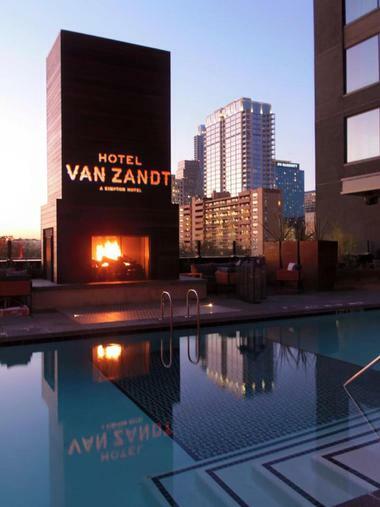 Right in Rainey Street District, the Hotel Van Zandt was inspired by the music scene in the city and is the perfect spot to enjoy local concerts and other events or attractions. There are 319 guestrooms, each of which has free wireless Internet and Bluetooth speakers as well as décor combining dark woods with bronzes. Depending on the type of room you choose, you can enjoy a king or queen bed or two queens, a mini-bar, luxury bath amenities, a sitting area, an oversized tub for soaking, and great views of downtown. The specialty suites add extra living areas, sitting areas, or dining areas. All rooms have access to a yoga mat as well. The hotel can accommodate pets and gives you access to the rooftop pool with full service and the fitness center, which is open 24/7. There is also morning coffee and tea service along with a social hour later in the day. Guests can even borrow bikes. The hotel has its own stage with a rotating music lineup, and you can enjoy your meals at Geraldine’s, the Pool Deck, or Café 605. This particular hotel is designed to be a place where eco-conscious travelers can relax right in the historic SoCo district. Guests can stay in one of four private cottages complete with elegant appointments. The cottages have similar basic amenities such as DVD players, stereos, TVs, hair dryers, irons, coffeemakers, fridges, and microwaves. 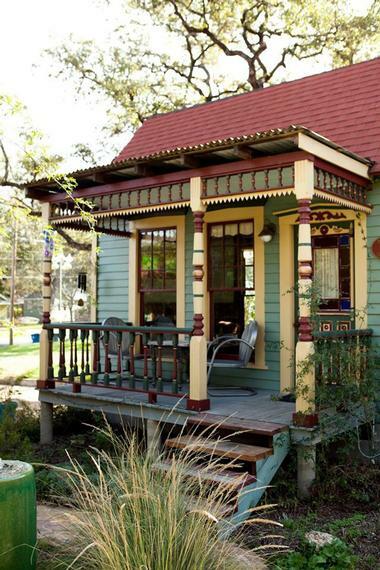 Each cottage is unique with some having stained glass windows, sleeping lofts, pine floors, extensive living areas, oversized showers, antique claw-foot tubs, or Indian themes. The lodgings include access to the on-site natural pool, which is hidden in the shade of live oak trees. In the morning, you get an organic vegetarian breakfast that you can eat on your private deck or in your cottage. The hotel also offers free parking, charging for electric vehicles, and bike rentals. 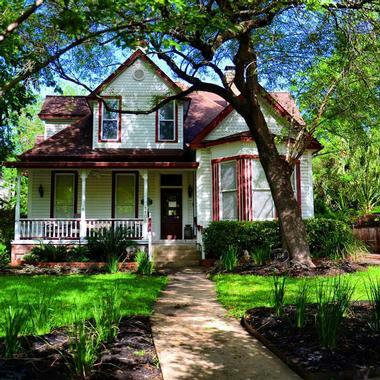 The Gateway Guesthouse is a boutique bed and breakfast with simple elegance that lets you escape from the urban environment of Austin while remaining close to major attractions. 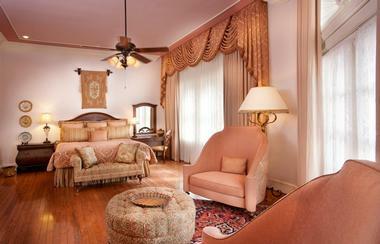 Guests can stay in one of the five rooms or the carriage house. Some accommodations have private entries, decks, private baths, hallway sitting areas with dry bars, views of downtown, or double sinks. 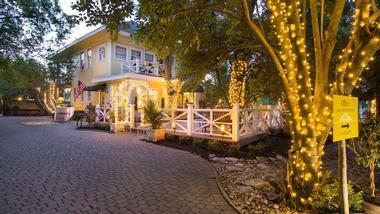 The Carriage House has a private deck, private bath, and private laundry facilities. Guests can even take a personalized cooking class while at the Gateway Guesthouse, where you can focus on a specific topic of your choice and involve a small group of friends. Afterwards, you can enjoy the meal you made. The morning begins with a critically acclaimed breakfast prepared by a professional chef. You can also get a meal at most other times of the day. The Driskill’s building started as the showplace of cattle baron Jess Driskill in 1886. 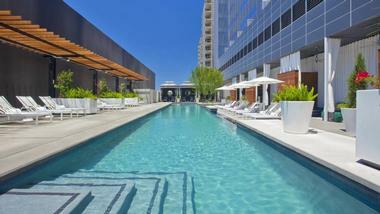 It is now among the Historic Hotels of America and gives guests luxury accommodations right in downtown Austin. All rooms have complimentary Internet and are smoke-free. The rooms have unique historical artwork mixed with contemporary pieces and custom beds featuring luxurious linens, signature custom furniture, a work desk, a Plasma TV with premium channels and pay-per-view movies, plush robes, personal care amenities from Fine English, minibars, custom vanities and tubs, and in-room safes. Other hotel amenities include concierge service, daily newspapers, turndown service, same-day dry-cleaning or laundry, and complimentary shoeshine. There is even a pampered pet program. The on-site restaurant, the Driskill Grill, opened in 1929 and has inventive cuisine and a great wine selection. If you prefer, you can order in-room dining 24 hours a day, eat at 1886 Café & Bakery, or get a drink at the Driskill Bar. The elegant Hotel Ella has 47 guest rooms with luxurious appointments, including ten suites. Each of the guest rooms has an LED flat-screen TV, an in-room safe for your laptop, complimentary Wi-Fi, a minibar that has been curated with local products, an in-room cordless phone, a hair dryer, valet laundry for the same day, a vanity mirror, luxurious bed linens and bath sheets, custom body care products, microfiber robes, a complimentary local newspaper, overnight shoe shine service, and housekeeping twice a day. Guests can choose a room with a queen or king bed or two queens. The suites also include sitting areas, and some even have floor-to-ceiling French doors with easy access to the verandah. Goodall’s Kitchen is an American bistro right inside the hotel that is perfect for casual dining indoors or outdoors. Guests can also enjoy a handcrafted cocktail or snack at the Parlor Bar. There are nine types of guest rooms to choose from at W Austin and they can sleep two or four guests. Most rooms have amenities such as clock radios, iPod docking stations, oversized work desks, 40-inch Samsung LCD TVs, high-speed Internet access, and cordless phones. Some rooms also have minibar towers, queen or king beds, chaise lounges, living rooms with suede sofas, larger TVs, multiple phones, and leather bars, and the EWOW Suite to let you take music enjoyment to the next level. 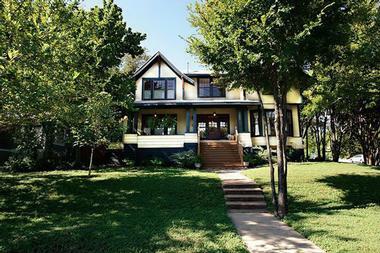 The Austin Folk House is a charming bed and breakfast that actually offers the closest accommodations to the University of Texas at Austin, making it popular around graduation and other major university events. Each of the rooms has bath robes, hair dryers, shaving mirrors right in the showers, irons with ironing boards, a bubble bath and bath pillows, alarm clocks that combine a radio and sound machine, bed sheets with a high thread count, free local phone service, cable TV, access to the video library, and Internet access. The nine rooms each have their own personality and décor. Some rooms have king or queen beds, iron bed frames, antique desks, antique armoires, handmade coverlets, and tubs in addition to the shower. 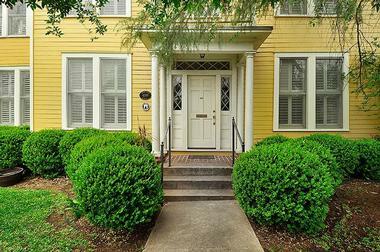 Guests enjoy sitting on the south-facing front porch and people watching or eating their breakfast outside. You will also find a small sitting area with a great view of the Capitol. The day begins with a delicious homemade breakfast, and the bed and breakfast can usually accommodate special diet needs. The building for the Adams House was built back in 1911 and has since been expanded and undergone renovations to restore the original pine floors and 12-foot ceilings. Each of the five guest rooms has its own unique character with similar amenities. They all have complimentary wireless Internet that extends throughout the property, hair dryers, complimentary bottled water, central air conditioning and heat, and ceiling fans. Brava House is the only bed and breakfast in downtown Austin, and its convenient location in Old West Austin makes it perfect for visitors. 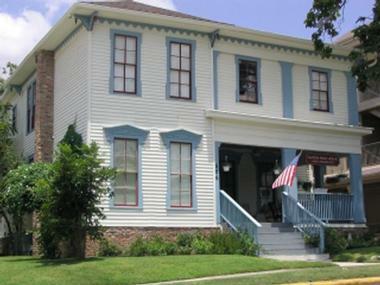 The building was one of the first Victorian homes in the city and dates back to the late 1880s. The rooms are all private with no adjoining walls. Each room has a private bath, a cable TV, a mini-fridge, a coffeemaker, high-speed wireless Internet, a radio alarm clock, an iron, a hairdryer, an individual thermostat, hardwood floors, and high ceilings. Suites also have microwaves. One of the guestrooms can sleep three people while the other four can each sleep four. Choose the Casablanca or Garbo rooms for a romantic getaway. The Brava House also gives guests access to two neighborhood pools. On the grounds, you can enjoy the private back deck, the verandah with sitting chairs, and the garden with pond. There is also a private parking lot. 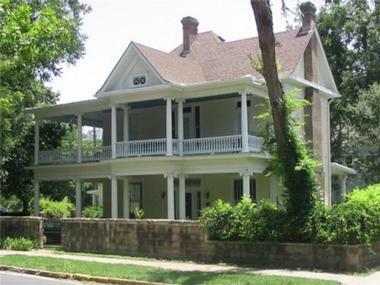 The Quarters at Hardin House is open during the summer between graduation weekend for the University of Texas and mid-July. This inn is in the style of a bed and breakfast, and all rooms are non-smoking. Each room has wireless Internet, daily housekeeping, cable TV, and phones. Guests are also welcome to use the on-site computer with high-speed Internet. You can choose a room with a king bed, a single bed, or some combination. Many rooms have private baths, while some have shared ones. 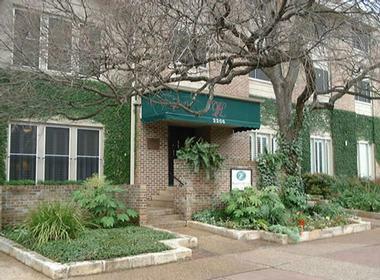 The inn has a very convenient location right by the UT campus, and there is free guest parking. The inn even has an exercise room for guests to use that includes exercise equipment as well as free weights and mats. Guests can also enjoy the atrium garden or relax in the dining and living areas. The daily breakfast includes a hot entrée as well as tea, coffee, milk, juice, yogurt, homemade pastries, breads, fruits, and cereal. There is fresh coffee 24 hours a day and ice cream most of the time. The Star of Texas Inn is made up of two buildings, each of which has the same amenities and similar pricing. Every room has a private bath, but you will notice some have showers while others have tubs in addition to showers. There are eighteen rooms in total, and guests can choose the one with the amenities and décor they prefer. All guests receive complimentary parking, wireless Internet, and breakfast. The houses also have relaxing gathering areas with sofas. The porch features a nice set of table and chairs perfect for enjoying a meal. During the day, you can get cookies and other sweets off the mantle in the parlor. There is also a guest fridge with complimentary lemonade, soda, and other beverages, as well as room for guests to use for their own leftovers. For breakfast, you have the choice of a buffet or a made-to-order dish. The buffet typically includes a savory dish and a sweet dish as well as orange juice, fresh fruit, bagels, and coffee. In many cases, the inn can accommodate dietary restrictions. The Fairview is a relaxing bed and breakfast featuring six luxurious guest rooms, including three suites. Every room has its own in-suite bathroom for convenience and privacy, and they can sleep two or four. Guests also receive complimentary access to Hulu, Amazon Prime, and Netflix. Some rooms are even dog friendly. Other room amenities include hypoallergenic pillows, luxurious and local bath products, keyless door locks, and new 57-inch HDTVs. The Fairview has free wireless Internet throughout the property and free parking. The included breakfast is a delicious and healthy buffet that typically includes homemade granola and honey yogurt, fruit salad, hard-boiled eggs, and fresh scones or muffins. The bed and breakfast can also accommodate dietary restrictions with prior warning. Throughout the day, you can enjoy complimentary tea and coffee or sparkling water.